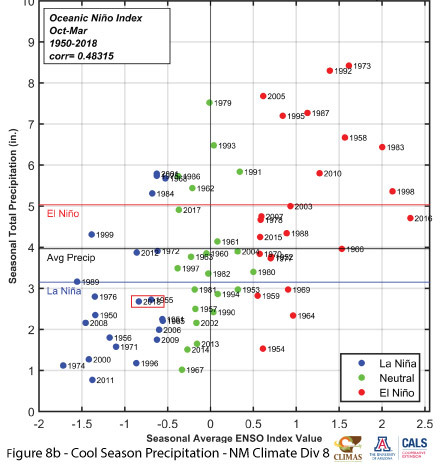 Monthly and cool-season (Oct-Mar) precipitation totals demonstrate how this La Niña year compares to previous years, and helps characterize the influence of ENSO on cool-season precipitation. 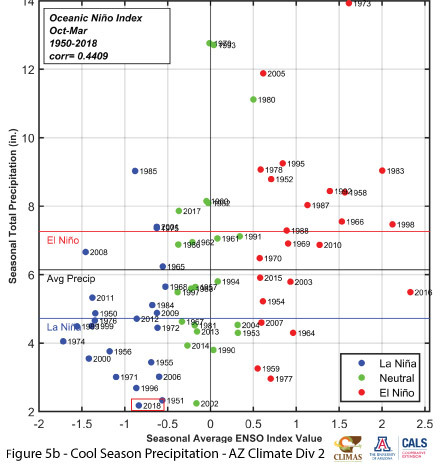 Figures 5a-8a describe monthly and cool season precipitation totals at four weather stations (Flagstaff, AZ; Tucson, AZ, Albuquerque, NM, and El Paso, TX), where each dot corresponds to observed monthly and cool-season precipitation for each year since 1950, color coded by the ENSO status of that year, and the horizontal black lines correspond to 2017-2018 precipitation. 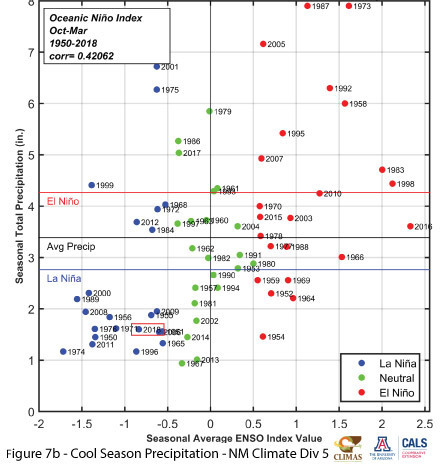 Figures 5b-8b are scatterplots of ENSO index vs. precipitation totals for the regional climate division that contains each weather station. 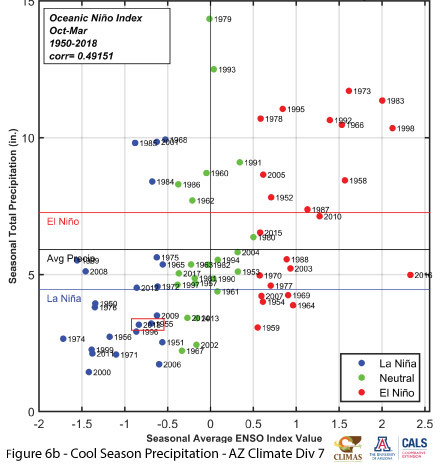 A closer look at individual stations highlights some notable observations. 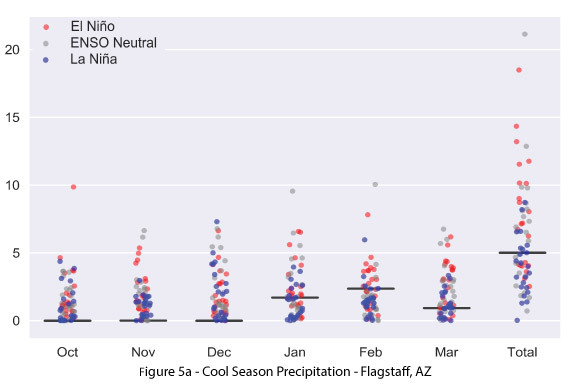 Flagstaff recorded almost no precipitation ​from October through December, and ​the corresponding climate division recorded record​-​dry conditions for the ​entire ​Oct​ober​-through-Mar​ch​ period. 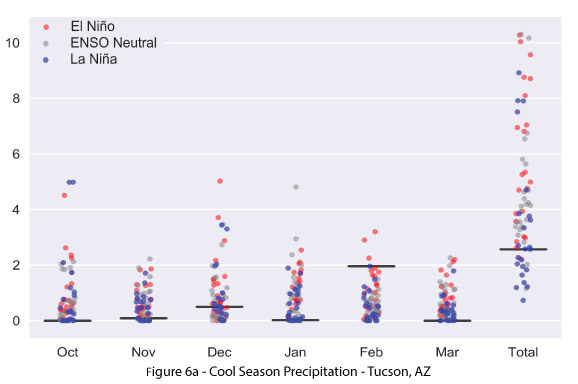 ​In Tucson​, nearly all of the October-through-March precipitation fell over just a few days, and ​the plot illustrates the ​role ​that those​ few storms play​ed​ in boosting seasonal totals. 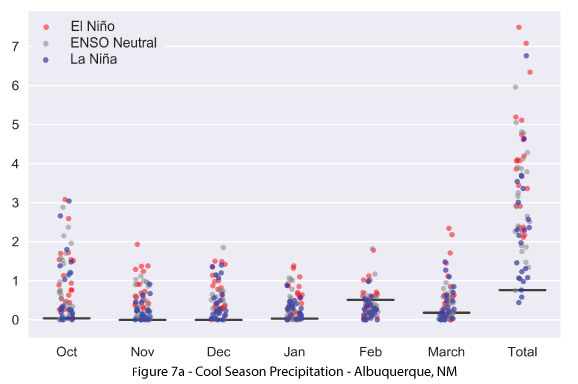 Albuquerque had a run of months with near​-​zero precipitation ​broken by a ​few storms in February that boosted the station from record​-​dry to ​merely top​-five driest, while the ​regional climate division was just below average. 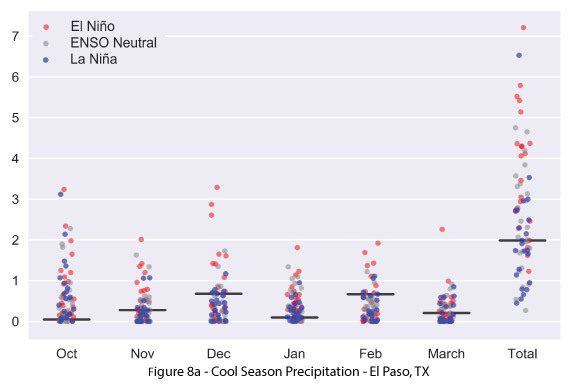 El Paso fared better than many regional stations, but still recorded generally below​-​average precipitation.